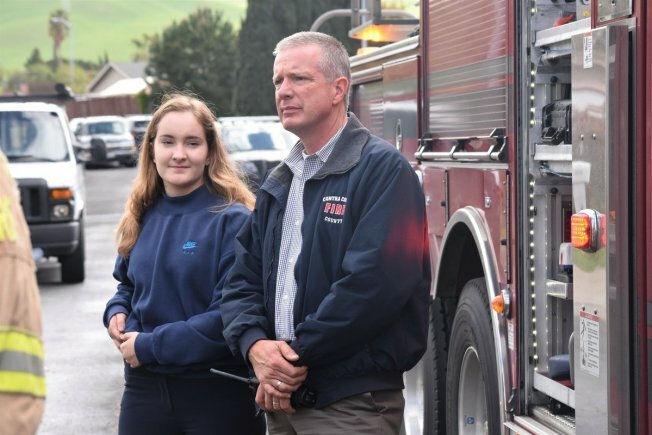 On his last day on the job Wednesday, Contra Costa County Fire Protection District Chief Jeff Carman was on his way to a meeting in Antioch when he heard the report of a fire on Highgate Way in Pittsburg. He was only a few blocks away, as it so happened, so he decided to stop by. "I thought I'd go down there and talk to the guys and say goodbye," Carman said in a Saturday interview. But this was no simple visit to a fire scene — it turned out Carman was the first firefighter to reach this southern Pittsburg house, and the smoke coming from the house was substantial. And someone, he was told, had gone in to find a pet cat. "I was preparing to go inside without my gear," said Carman, 55, who spent five years as CCCFPD's chief. officers who had tragic final days on the job; he didn't want to be a statistic like that, he said. "You hear these stories ... about guys, 'he was almost retired ...'" Carman said. "Then this guy came walking out, and a cat was following him." The fire, in the 3900 block of Highgate, was called in at 2:54 p.m. Wednesday. CCCFPD spokesman Steve Hill said the fire started in the kitchen. Carman arrived on scene at 3:02 p.m., and reported "Single-story, single-family residential working fire." Other firefighters arrived moments later, and the fire was out by 3:13 p.m., Hill said. No one was injured, including a cat and two dogs, one of whom had been adopted just the day before, likely saving his life, Hill said. But the house was a total loss. Hill said two adults and two children were displaced, and the American Red Cross was dispatched to assist them. After Carman made sure everyone in the house was safe and alerted arriving firefighters on the overall situation, he still got to meet with firefighters. He also got to say hello to his daughter Hallie, who was riding along with one of the responding engine companies. His comrades even named the call after him - "CarmanIC." It was neat to end my career like that," he said. "It will probably be the last fire I ever respond to."